Being recruited to play on the college football team of your dreams can seem like a very big, even unattainable, dream. However, there's good news. If you are willing to put in the time, effort, and hard work, you may have a shot at playing college football. You must be willing to dedicate yourself to playing serious football while also excelling in your academic classes to make it as a college football player. Many youth want to play college football. Football players not only get to pursue their athletic dreams, but football players who play at large universities also earn scholarships for their athletic efforts. The best thing to do is work hard both on the field and in the classroom, and make sure to maintain a great relationship with your high school coach. The best way to get on this scholarship track is to discuss aspirations with the high school football coach. Parents and their students should meet with the coach to get feedback on this possibility as early as your freshman year. It's important to realize that colleges have strict rules regarding the contact that a college coach can make with a player. 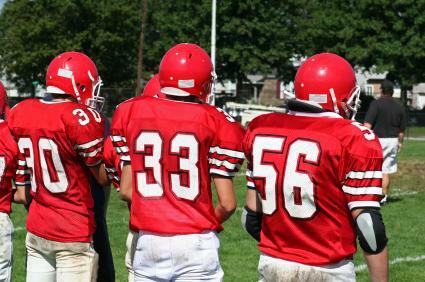 Therefore, the high school coach plays an important role in getting your teen noticed early on. While you do need to be an excellent football player to be recruited by a college football coach, you most certainly do not have to be the star of your team. If the coach thinks that you can play well on his team, he can recruit you. The key is to showing him what you can do and how dedicated you are. Try to have your skills objectively evaluated by your coach or other trusted staff members of your high school athletic department, then ask for help on improving all your weaknesses well before the college recruitment process. Set yourself up for success by working hard along the way. That way, when push comes to shove, you won't have to be stressed. Students who want to earn a football scholarship can't skate by on their athletic ability. College football scouts expect a student to have at a minimum, passing grades in all of their classes. ACT and SAT scores are just as important. Even if you play college ball, you'll still have to take college classes and pass them to remain eligible. Additionally, the NCAA has GPA and academic requirements. Meet with your academic advisor often to help you establish a game plan for your class schedule and grades. Remember, scholarships are very competitive. Football is a 'head count' sport, meaning that the NCAA limits each college to signing 25 incoming freshman football players for scholarships each year, if it used the full 25 scholarships in the previous year. Also, if you are on the bubble when it comes to admission to a college, being recruited for the football team can help if you've expressed a strong interest in the university; however, you still need to be very close academically to make the cut. Although playing college football undeniably takes up a lot of your time, set aside time to get involved in other things that interest you at school. No matter how talented you are as a football player, it's still important to show universities that you are a well-rounded student. Whether it's writing for the yearbook or singing with the glee club, you'll really impress the admission's office at potential universities if you show initiative in participating in more parts of your school than academics and athletics. Extracurricular activities indicate your interests and can showcase both hard work and dedication. Certain high schools are consistently ranked higher than others are because they have a strong football program and compete with other top ranked schools. These schools are sometimes scouted first, as college coaches are looking for recruits. Because stellar high school coaches can be drawn to certain hotbed areas and schools with strong teams, they help train "blue chip" players. However, these top-ranked high school athletes don't necessarily turn out to be excellent college players, and you can be recruited from any high school. Some high school football players have a leg up because they get to play on a top-ranked high school football team. Such an advantage already lets college recruiters know about them, but that doesn't mean that you can't make your own strengths and advantages work just as well for you. Be proactive even if you don't yet anticipate that the recruiters will come knocking on your door. Play to the best of your ability at each game, even when you have no expectation of receiving visitors or potential recruiters. What do you do if you're not in a top-ranked high school football program? The answer is simple: if you have the drive and the athletic ability, the recruiters will come. This means that you have to do well on Friday night and be noticed by the local media. If you can create a buzz, then subsequently get photographed and video taped, you are well on your way to getting college scouts to notice you. If enough media attention happens, recruiting subscription services will pick up your name. College football scouts subscribe to these services, and this is how they'll find you. Take the time and invest the money to make a highlight reel of your accomplishments as a high school football player. Once you have perfected it, be sure to send a copy to the coaches at the colleges where you most want to play, ideally right after your junior season. A reel that shows a strong athletic ability is likely to spark some interest, and you may opt to send it during your senior year instead. Invite only camps are held the summer before the senior year of high school football players. Try your best to attend them to kick off the recruitment process because they are a way to really get noticed. Some camps include Elite11, Ultimate 100 Camp, and Nike Camp. If a coach has already shown an interest in you, you may opt to go to a camp at that school to further show off your skills. Going to a camp at the college of your choice also will help give you the feel of what campus life will be like. Photographs of you in your uniform. Ask any of your current or past coaches to write endorsement letters. Ensure that the web address is something that's easily remembered, then place the link on the top of all your social media websites. Send it to potential coaches, and update it whenever you can. Athletes can make an unlimited number of unofficial visits to prospective colleges. If you're really interested in a particular program, make an effort to show your interest and stop by to talk with the coaches at the college. This is most effective after you've sent the college coach your media kit. It is also a good idea to remind college coaches throughout the season of your interest with personal phone calls from a parent. Be cordial, polite, and sincere with every communication; persistence pays off as long as it's not at the cost of being pesky. Once you've thrown your hat in the ring to be considered as one of the high school football recruits, expect scouts to show up and watch you play. They usually won't tell you they are coming because they want to see the real you. For this reason, make each game your absolute best. Avoid any conflict with the coach and players because you'll never know who is watching. Even if you're the best player, bad sportsmanship won't earn you any points with college coaches. They don't want to deal with a difficult player in the fall. Keep in mind that you need to adhere to the rules that NCAA has established when it comes to the recruiting process. Never go along with a coach who doesn't honor them, and feel free to contact the organization if you are unsure about whether an action is alright or appropriate. You are officially in the recruiting process if, as a student, you are contacted on more than one occasion by a university's football coach. During this phase of the recruitment process, which is called the Contact Period, the football coach may opt to visit the potential student recruit and his family members. It's during the Evaluation Period that the coach may opt to attend practices and games where the student is playing. However, don't feel slighted if a coach visits to watch you play but doesn't talk to you. That's just the way it goes. A coach is not allowed to talk to you during the entire evaluation period of the recruitment process while he is visiting a school to see you play, but telephone calls are perfectly okay during all the phases. This is the part of the recruitment process where you can visit the college of the coach who may be hoping to recruit you to his time. During the Quiet Period, the coach is allowed to talk to you while you're visiting the campus, and it's perfectly acceptable for you to say hello and chat with the coach. This shows your interest and allows you to get a better idea of what the college is really like. Although this part of the process sounds rather morbid, it's totally pain-free. The Dead Period takes place during bowl season, and no in-person recruiting is allowed during this time. The college coach won't have any face-to-face contact with the student athlete. It is okay for you to contact the coach via phone calls during this period, though. What position would you want me to play if I were to be recruited? How many total players do you have? How many freshman will likely be on the team? Can you explain more about what your training schedule is like? How much playing time would it be realistic for me to have in my first year? What kind of community activities do you host or organize? What types of scholarship are typically offered to incoming freshmen athletes? Every student's situation is unique. Don't be shy about asking anything that comes to your mind. As long as it's sincere and politely stated, no question is off limits. You may feel euphoric when you finally get noticed and have a recruiter at a game to see you play. The journey is just beginning, though, and it shows that you have initiative when you're proactive in how you follow up with a college football recruiter. After a college football recruiter has shown an interest in you, it's a great idea to write a follow-up letter to say thanks. In the letter, express your sincere gratitude, and then move in to mentioning any other triumphs, awards, or sports successes that you may have since you last spoke with the recruiter. If you have not spoken to him before, fill him in on the highlights of your athletic past. Add any other relevant information, then express your thanks again. Be sure to include your name, phone number, physical address, and email address on the letter. If the recruiter has expressed to you that he prefers email or has offered you his email address, you may opt to send the letter via email, but it's perfectly acceptable to send it via USPS mail otherwise. Remember that you are never allowed to send gifts to accompany the letter; that's against the NCAA rules! Start social media accounts that are just dedicated to football! Add coaches and colleges. Although a coach may not be able to contact you, you can contact him. Be sure to follow all NCAA rules when it comes to social media. Never track down a coach's personal or private page. Only engage recruiters and other athletes on pages that were clearly created for chatting about football. Always be polite, and leave the colorful language off every post, even private messages with your peers. Trust me; they can be used against you. If you don't end up being recruited, never use your social media account to vent. You may opt to stop "following" a school or athletic team that did not invite you to join the team, but that's as far as you should ever take it. Colleges follow and look up social media accounts these days, and other schools that are not the target of your ire may still not want to deal with you if you are publicly trashing other teams, players, or schools. Some very lucky high school football players have the tough but privileged challenge of deciding between two different colleges who have offered them football scholarships. If you have received more than one offer to play football, you want to be thankful and celebrate that incredible accomplishment. Next, you want to get down to practically making this choice. Since this is all good news, you may feel reluctant to question these offers. However, the recruiting coaches totally expect incoming students to pepper them with questions. Feel free to contact the school with all the questions that you may have. Even if you don't think you will accept the offer of one school, always be polite and treat each person along the way with respect. Not only is that the right thing to do, but you never know when you may end up going with even a lower priority school throughout the recruitment process. Try to approach the decision objectively. Although you may have a natural inclination to go towards a certain school for impractical reasons, try to look at the big picture. You want to consider the overall reputation of the school, not only its football team. Keep in mind the full amount of the scholarship that is being offered, what your expected family contribution would be to each school, whether extra expenses are covered, and whether the team is one that will both accept and challenge you. Make a list of pros and cons, and be sure to seek advice from your coach, your parents, and others that you trust. National Signing Day is an exciting day! If you have been recruited to more than one school, it's a time for decisions. National Signing Day usually takes place on the first Wednesday of February, and it is simply the earliest that a high school senior is allowed to sign a National Letter of Intent to play college football at a university that's a member of the National Collegiate Athletic Association. Before you sign a National Letter of Intent, you need to know for sure that you want to go to the school who is extending the offer and that you want to play football there. You need to hear from the coach that he wants you on his team. You also should know all the crucial details about how going to the school will be possible. Make sure that the obligations your family will have can be met and that your financial aid package works for you. If you have any doubts, refrain from signing because it's only the first day that you can sign, not the last. So you have signed your National Letter of Intent to play at your chosen college! Now what? Well, basically, that's it. You simply make your decision official. It can be a big relief after years of preparation, practice, hopes, and dreams of the glory of college football. Just to have that decision and honor set in stone can be a huge relief, so oftentimes the day comes with a big party to celebrate the accomplishment. If you sign up to play college football, you are likely to find your name mentioned in local or national newspapers and sports websites. While most college sports enjoy a National Signing Day, the one that's famous and the most closely followed by fans nationwide is football's decision day each February. It's understandably a big deal in the life of a high school senior who is vying for an athletic scholarship, and even the media reports on the results. In the past, some players even wind up with their own press conferences, such as when Antonio Logan-El signed with Penn State. Not every high school football player gets recruited; even star players are sometimes left without an offer. Try not to take it personally because so many factors go into recruitment choices. Don't worry; that doesn't have to be the end of the road for your football career. There are still a plethora of educational and athletic options for the football players who don't get recruited to play college football. You can walk on to a college football team if you are not recruited for an athletic scholarship. Yes, you still get to join the team, but you are not on scholarship and must pay your way through college. At the same time, you are expected to do all the work that scholarship players do and show up for all games and practices. Because of its challenges, this is not a popular choice, but some athletes even make this choice when they are not recruited by the exact team that they wished to play on. Keep in mind that every college has its own walk-on policy, so check with the school of your choice before making any plans or assumptions. Yet another option is to play intramural football while you're in college. Many colleges have intramural sports, including recreational football teams for students who play for the love of the game. It does not require the huge level of commitment, work, and time that walking on a competitive college team does. You are still able to play the game that you love, and it provides a great deal of fun and exercise. If you enjoy other athletics beyond football, you may choose to spend your college years focusing on another sport. If you are lucky enough to be skilled in multiple sports, you may even opt to try out for scholarships in other sports while you are attempting to be recruited as a football player. Because of the time and work that goes into each sport, it's not all that common, but it has been done. Just be sure that you are only trying out and spending all that effort on sports you truly enjoy. Keep in mind that the best thing that you can do in preparation to be a college football star is to work on improving your football skills with the help of your coach, make a great effort to keep a stellar academic record, and be involved in things in your own community that interest you. Being a well-rounded person is ultimately also what makes you appealing for potential colleges who are looking for their next football star and academic champion.